When Franco-Brazilian architecture firm Triptyque revamped a 1970s office tower in Rio de Janeiro, the renovation was more than just a pretty facelift. The new design incorporates eco-friendly and energy-efficient systems, making Rio Branco 12 (RB12) the first commercial building in Brazil to use solar panels and hydrogen cells to generate electricity. The renovation project was completed in collaboration with property developer Natekko and project management firm MMC Investimentos. Located within the heart of Rio de Janeiro’s business and economic district, the 85-meter-tall RB12 sports a new bioclimatic facade with zigzagging glazed panels and louvers that reduce solar heat gain but allow desired natural light in. Natural ventilation flows throughout the building. Plant-filled balconies punctuate the sculptural facade and aid in natural cooling. The landscaping is irrigated with harvested rainwater, which is also used to flush the toilets. “RB12 embodies an innovative new concept of sustainable development based on energy production, thus following the global trend of green-refurbishment, which consists in adapting and upgrading old buildings in order to align them with sustainable development criteria,” say the architects. “Among the environmental requirements that RB12 comprises are: thermal comfort, managing water consumption, optimizing natural light system, clean energy production through solar panels and fuel cells.” RB12 was redeveloped as part of Porto Maravilha, an area undergoing urban revitalization to improve living conditions in downtown Rio de Janeiro. 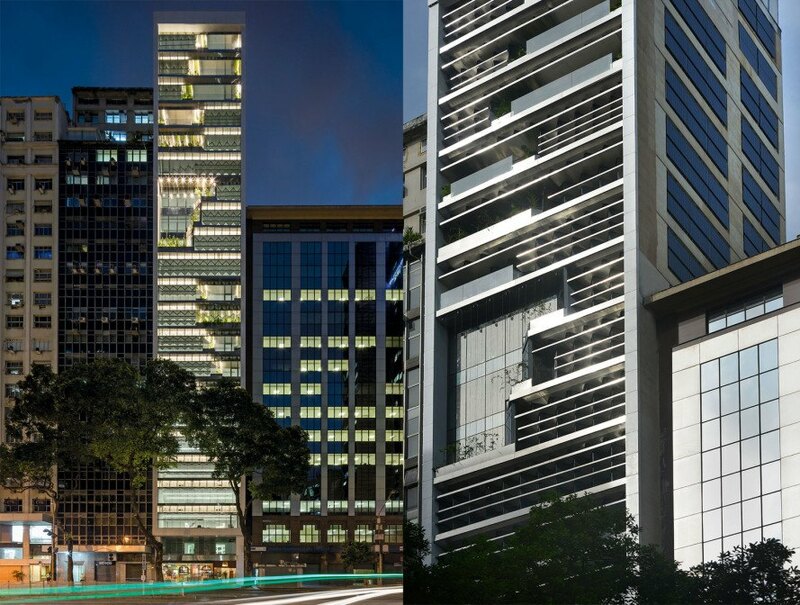 Located within the heart of Rio de Janeiro’s business and economic district, the 85-meter-tall RB12 sports a new bioclimatic facade with zigzagging glazed panels and louvers that reduce solar heat gain but allow desired natural light in. Natural ventilation flows throughout the building. 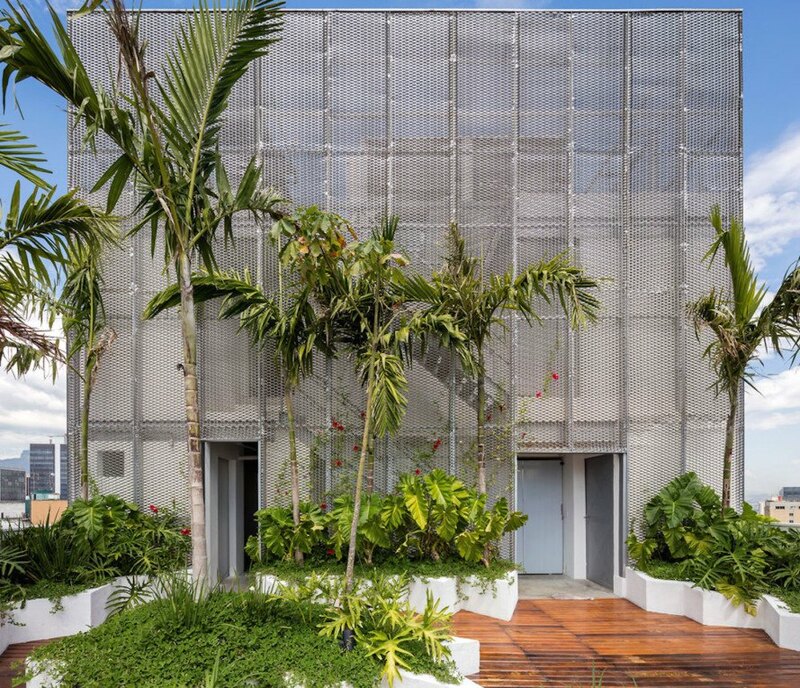 Plant-filled balconies punctuate the sculptural facade and aid in natural cooling. The landscaping is irrigated with harvested rainwater, which is also used to flush the toilets. RB12 was redeveloped as part of Porto Maravilha, an urban revitalization project to improve living conditions in downtown Rio de Janeiro.